Genetic mutations can create new and sometimes beautiful forms of life, like the crested cacti featured in this garden. Cells in these crested cacti get mutations during development that make them start growing out of control, creating beautiful sculptural forms as they develop. This condition is similar to cancer in humans and other animals. Part of being a multicellular organism means having cells that divide and can mutate during development. 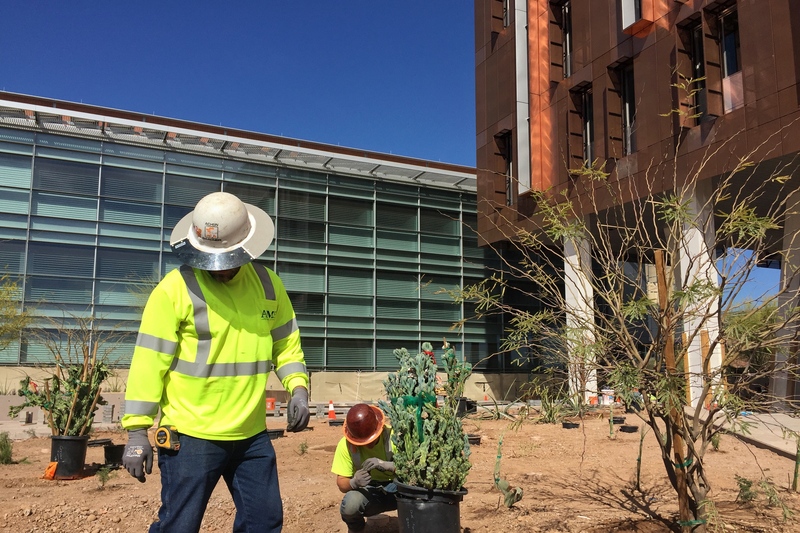 We are creating a garden full of mutated cacti at Arizona State University to illustrate the ubiquity of cancer throughout multi-cellular life forms. This is a garden of optimism because many forms of life – like the beautiful cacti in this garden – live with mutated cells. We will keep you updated of the garden’s progress and hope you can visit to experience the remarkable diversity of forms generated by cancer-like mutations. Support for the garden comes from the National Cancer Institute, the Arizona Cancer Evolution Center, ASU Biodesign Institute, ASU’s Frankenstein Bicentennial Project, ASU Office of the University Architect and Facility Management Grounds Department, MOORE / SWICK Landscape Architects Partnership, Trueform, Airpark Signs, Lincoln Center for Applied Ethics, and people who have been impacted by cancer. Collaborators include Athena Aktipis, Carlo Maley, and Caspian Robertson of Surrey Gardens (London). The late October rains have done wonders for the garden. The mesquite trees are growing fast and starting to provide shade and the cacti are coming along nicely.